«Civil wedding contract, marriage vows between city and citizen». An art proposal which draws a parallel between the love of a couple and the love of a city and of the citizen. 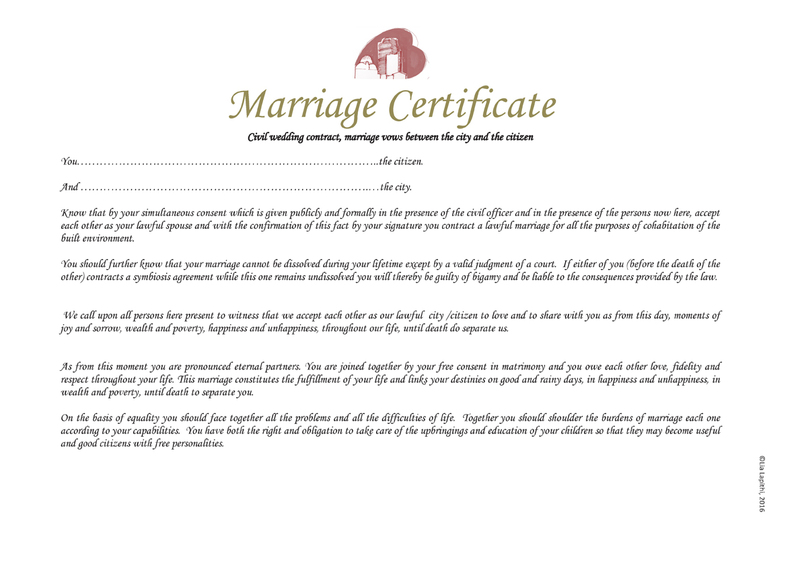 An authentic copy of a marriage proceeding by a Municipality of Cyprus is adjusted to suit the vows between a citizen and a city. Theo. David, FAIA, architect/Pratt Institute and visiting professor at the University of Cyprus. 13. unanswered questions to be discussed further on  what are the benefits of the people and the city of they agree on a common agreement?  married couples give oaths to each other, politicians and mayors give oaths or pledges to obey the laws but there is no oath to work for the people but only for the laws! should there be one and why?  shouldn't the politicians give oaths that they should work also for the personal benefits of the citizens?  people give oaths for citizenship but not for the city...why?  should one marry the city or cohabitate with the city?  there are no laws or past agreements between people and cities, or maybe there are. further investigation required. is there a reason on this?  what reasons to we need to marry the people and the city?  what benefits do the people and the cities have if they agree on this agreement of cohabitation?  will anything change after signing or will it be just another way of making a new document for "divorce"?  should one get married with the city just to acquire the citizenship?  Love (a strong feeling of affection), nationalism (patriotic feeling, principles, or efforts) and patriotism (vigorous support for one's country) got to do with this agreement?  Nationalism and patriotism is about the country while our discussion is about our city.  cohabitation agreements talk about everything except love! shouldn't love come into this?
. Benefit per se quantitative term, it implies a marriage of convenience at best which can eventually in certain cases evolve into a marriage of love but not necessarily. I believe one should enter a marriage with not the intention to take (benefit) but rather to give and share. According to Friedrich Nietzsche, to give a vow would be equivalent to resistance, to take action. Giving a vow of marriage, the bride and groom agree to determine their own destiny without outside help. An empowerment ceremony where not only one of the two will not wrong another, but collectively for a common future will resist the time to overcome the conditions differences, differences that threaten to cancel the deposited good intention, declaring that what they promise fulfillment one makes. That amid the changes (sickness and health / wealth and poverty) will remain consistent. Over and over temptations, they will remain faithful to their path. Municipal authorities and the people who represent them should of course follow the laws, however the laws give a lot of flexibility how they are interpreted. Similarly the citizen should obey the law but also take initiatives to improve the city and vice-versa. So Yes, there should be a vow (oath, pledge or promise if you like) which would be over and above the legislation and should cover everything that is not set by law. The running of a city should not be undertaken by active politicians but by persons who love and cherish their city and their citizens putting them above party politics. In a married couple it is not advised to bring work-related issues into the family home. so yes, the basis of this married to your city vow is precisely to make one also, but based on love and respect, and not a vow of citizenship which is based on patriotic and nationalistic feelings. In our case, we do not ask for citizens to die for their city, but to live for their city. Marry or co-habit? Marriage is a bigger commitment than simply cohabitation. What if we gave never promises, wedding other each other? Perhaps the problem is that we live in an era of abundance of goods and options, we have developed the impression that love is a pleasure that can be renewed periodically, just like they buy a new house. Instead, the bonds of marriage set a pre-permanence, a continuation of love through time where we do everything to ensure a common destiny. There are tens and hundreds of laws and past agreements between people and cities, regulations that cover the obligation of both citizen and municipal authorities, but none emanate or imply the existence of love between any of the parties. Legislation requires things to do or things not to do, its like living in a marriage where the two parties are civil towards each other, they have their own tasks well defined and agreed, but for which there is no love, only co-habitation rules. Marriage implies something more than just rules, it includes love, caring and respect. Reasons to marry people and their city is like asking reasons why people marry each other. They dont have to, they dont need to, yet they still do. With my proposed vow perhaps I should include incentives to marry and stay married, a dowry perhaps?! Or tax incentives and certain cases even facilities to obtain subsidies, or even better marriage counseling or even wedding vow renewals services! However, it is known that when marriages are made for financial considerations , solely with the interest against romantic love , the consequences are unpleasant . Conversely, when the only motive of marriage is true love , as simplistic as it sounds , the promise of love often remains alive as the day it was given . You ask if anything will change after signing, and leading to a new divorce document, doomed like many marriages? My answer would here would be whatever changes happen in a couple that get married will also happen with this marriage. The uniqueness of marriage is the fact that the promise given in writing and expressed publicly (bride, groom, mayor and witnesses), and thus this promise is legally and morally strengthened. Unfortunately the word citizenship confuses matters. A city is not a state, therefore citizenship which implies obtaining nationality confuses matters. Home is where your heart is, irrespective of your nationality. Nationalism-Patriotism refers to a country, not a city, any parallelism is irrelevant. The love we are referring to here is Love for a city. The parallelism of love in a marriage and love of a city is one of romantic love.